Africa after Modernism traces shifts in perspectives on African culture, arts, and philosophy from the conflict with European modernist interventions in the climate of colonialist aggression to present identitarian positions in the climate of globalism, multiculturalism, and mass media. By focusing on what may be called deconstructive moments in twentieth-century Africanist thought – on intellectual landmarks, revolutionary ideas, crises of consciousness, literary and philosophical debates – this study looks at African modernity and modernism from critical postcolonial perspectives. An effort to sketch contemporary frameworks of global intersubjective relations reflecting African cultures and concerns must resist taking modernism as a term of African periodization, or master-narrative, but as a constellation of discursive and subjective forms that obtains upon the present moment in African literature, philosophy, and cultural history. 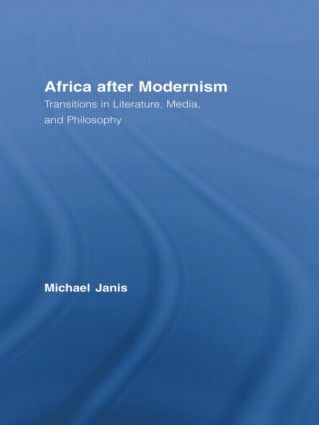 Africa after Modernism argues for a philosophical consciousness and pan-African multiculturalist ethos that operate, after the deconstruction of Eurocentrism, beyond self/other paradigms of exoticism or West/Africa political ideologies, in dialogue with postcolonial approaches to cultural reciprocity.